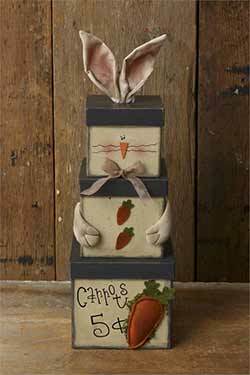 Paper mache nesting boxes, tissue box covers, and storage boxes, in country primitive themes - saltbox house, willow tree, star, heart, country sheep, crow, and more! 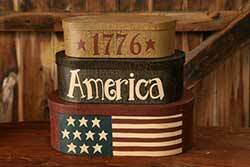 1776 America Patriotic Stacking Boxes - This set of 3 is painted in classic country primitive colors with a crackled finish. Top reads 1776 with stars, middle says America, and bottom shows an American flag. 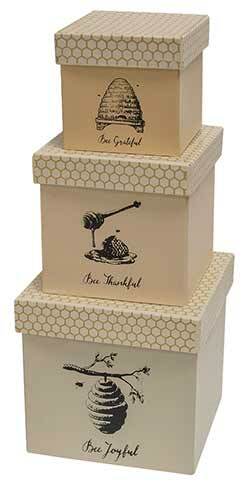 Great for both storage and decorative display, this box set features honeybee and bee skep images, and reads "bee grateful," "bee thankful," and "bee joyful." This one features a charming, old fashioned bath advertisement, in a color palette of country red, black, and tan. 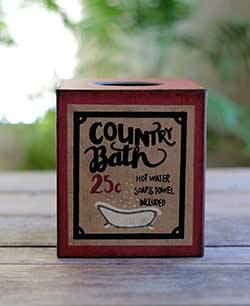 Reads: "Country Bath 25 cents; Hot water, soap, and towels included." 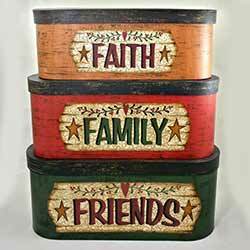 Faith, Family, Friends, Oval Stacking Boxes - Decorative and functional, paper mache nesting boxes are great for home decor and storage! 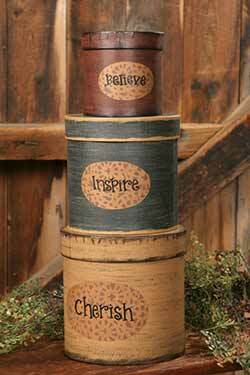 This set of three is painted in a palette of country green, red, and mustard gold, and reads: Faith, Family, Friends. SPECIAL ORDER. 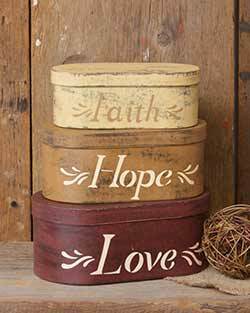 Faith, Hope, Love Stacking Boxes - Painted cream, mustard, and burgundy, and read: Faith, Hope, and Love. Features a folk art design of saltbox houses, sheep, and willow trees. Rreads: "Home is where your story begins." 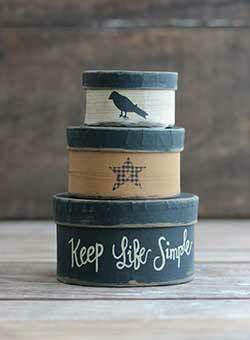 Painted in a palette of ivory, black, and mustard - Top has a crow, middle has a star and button, bottom reads "Keep life simple." 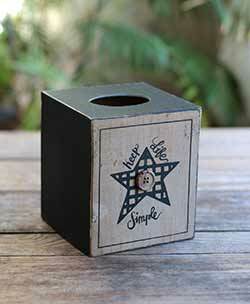 Features a classic black and tan primitive color palette and checkered star design. Accented with a button, and reads: "Keep life simple." 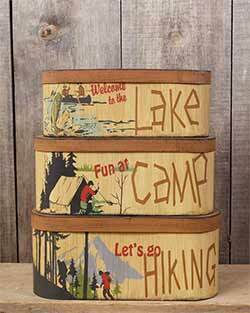 Lake, Camp, Hiking Oval Stacking Boxes - Decorative and functional, paper mache nesting boxes are great for home decor and storage! 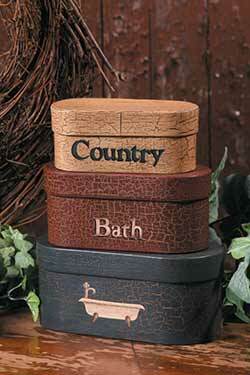 This set of three is painted with rustic camping, lake, and hiking scenes. SPECIAL ORDER. Top reads "snowy white bleach," and is accented with stars. Middle reads: "clothes pins." Bottom reads: "Laundry soap, 25 cents." 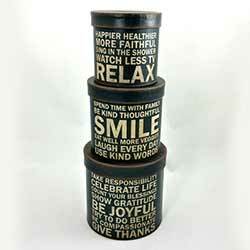 Live, Laugh, Love Stacking Boxes - Decorative and function, paper mache nesting boxes are great for home decor and storage! 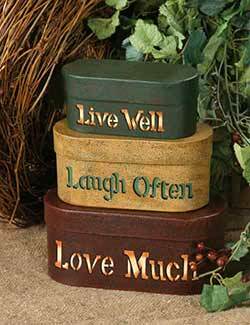 This set of three is painted in a palette of country green, mustard, and burgundy, and reads: Live well, Laugh often, Love much. SPECIAL ORDER. 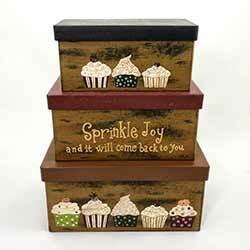 Decorative and functional, paper mache nesting boxes are great for home decor and storage! 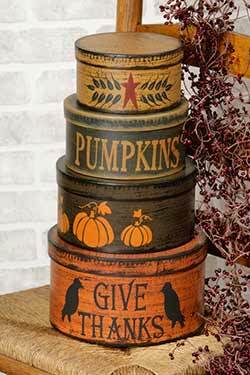 This set of three is painted in muted autumn colors, with designs of pumpkins and crows. SPECIAL ORDER. 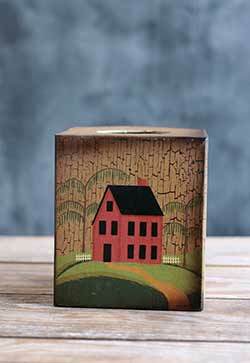 Features a country scene of a red saltbox house and willow trees against an antiqued and crackled tan background. 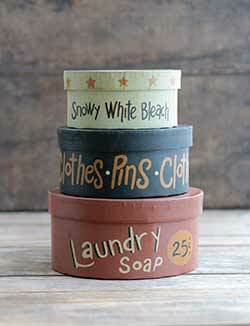 Primitive Round Stacking Boxes - This set of 6 is painted in classic country primitive colors. 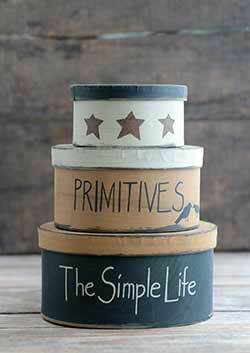 They can be left simple as is, or you can add your own artistic creations! Features a country scene of a red saltbox house, willow trees, and white picket fence, against an antiqued and crackled tan background. 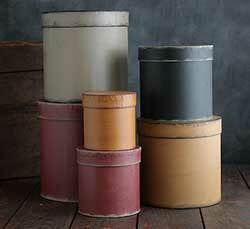 This set of three is painted in a palette of ivory, black, and mustard, with a distressed and antiqued finish.